A BBC investigation into Russia's treatment of asylum seekers has found disturbing evidence of neglect, abuse, and overt racial discrimination by officials. Our Moscow correspondent Daniel Sandford reports. Most people who come to Russia seeking political asylum arrive at the international airports in Moscow and St Petersburg, or cross the country's southern borders. 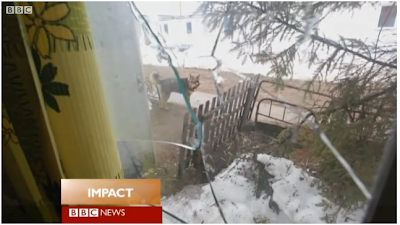 Ochyor, where the Federal Migration Service has set up Russia's only centre for destitute asylum seekers, is in the northern Ural mountains. To get there from Moscow you have to fly more than 1,000km (600 miles) east to Perm, and then drive for almost two hours. Or you can travel for 1,300 km (800 miles) on the Trans-Siberian railway. The centre is a collection of mobile homes on a small hill half an hour's walk from the town centre. Ochyor is a historic but run-down place where jobs are hard to come by. 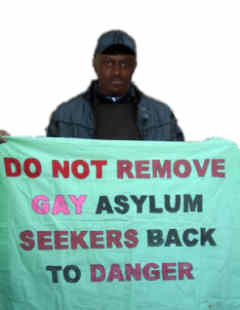 It is not only the isolation of their accommodation that the asylum seekers complain about. They describe a regime of neglect and even fear. "We asked for asylum and we are being persecuted," says Benjamin N'Guessan from Ivory Coast. "We were persecuted in our own countries and we are being persecuted here." As an example, he describes how they are taken to Perm for their court hearings. "When they have to take us by car, they put us in the boot - the closed boot of a car - for 100km." Like most asylum seekers in the country, he chose Russia only because it was easy to get a tourist visa, and then applied for asylum after arrival. The only European language Mr N'Guessan speaks is French, and he is being given no Russian classes. His friend Fofana Baleymory, also from Ivory Coast, says he was attacked in Ochyor last month. "I was assaulted by the son of a woman who works at the camp," he tells me. "We can't go out alone. We have to go out in groups. It is really dangerous for us to live here." After climbing up a steep wooded path still covered in snow to enter the camp through the back entrance, I found a collection of rotting mobile homes that had been used by East German labourers in the 1980s. The buildings were falling apart. In the bathrooms, there were holes in the walls. Many of the rooms had buckets in the middle of the floor to catch the water dripping through electrical fittings in the ceilings. Most walls were warped with water damage. The buildings were well insulated, but the residents said some bedrooms were bitterly cold when the temperature outside dropped to -30C, as it often does in this part of the Urals. The most serious complaints the residents made were about the newly-promoted director of the camp, Leonid Tsvirko. Frederic Karangwa from Rwanda said: "He is racist. But his racism is particularly targeted at us Africans." Mr Karangwa fell out with Mr Tsvirko while he was still the deputy director. It started with a row over Mr Karangwa's passport, which he was trying to get back after asking for it to be photocopied. When a member of staff would not return it to him, he grabbed for it, at which point the director attacked him. "He grabbed me forcefully by the neck. He turned me and dragged me to the floor, and I fell on my knee like that," he said. Mr Karangwa showed me a photograph of his badly-swollen knee. He said he also had severe bruising on his face. "Someone who commits criminal acts like that, and he is the director of the centre. We are afraid." No criminal charges were brought against the director, but independent eyewitnesses confirmed Mr Karangwa's version of events to the BBC. Another asylum seeker was taken away from the camp by international agencies because he feared for his life. The refugees complain that the food makes them sick, and that the camp administration has asked people in the town not to let them send faxes or emails, or even make phone calls. They said that their Iraqi friend from the camp, Abu Maxim, who was diabetic, died from a lack of medicine. The official inquiry said he died of natural causes. "Our friend Abu Maxim - it was we who buried him," Mr Baleymory explained. "If we had had the means, we would have gone and paid for the medicine for him. But unfortunately we had no money." During the day we spent at the camp, we saw one of the guards pushing an African resident. We also saw a group of young men from the village shouting Nazi slogans at the asylum seekers while we were interviewing them. Tatiana Margolina is the ombudsman, or human rights watchdog, for the Perm region, and has been monitoring the centre at Ochyor. "This institution is supposed to be a shelter for people who can't live in their own countries," she told me. "In my opinion, the main mistake the staff who work there made is that they didn't see this as the main purpose. There is a huge element of repression in the way the residents are being treated." We asked Russia's Federal Migration Service why people seeking refuge were being kept in such poor conditions in such a remote spot. Konstantin Poltoranin, the chief spokesman for the FMS, said it was planning to open a new camp. He told me that the African residents were probably complaining because they did not want to stay in Russia anyway, and were looking for another country to take them. He said that, in any case, Russia preferred immigrants of Ukrainian and Belarusian origin. "What is now at stake is the survival of the white race. We feel this in Russia. We want to make sure the mixing of blood happens in the right way here, and not the way it has happened in Western Europe where the results have not been good." As we left, Mr N'Guessan made a final plea to the outside world. "Here we are really traumatised and persecuted," he said. "And at this moment we don't know who is going to come to our rescue." Since Daniel Sandford's report was first broadcast, the press secretary for Russia's Federal Migration Service, Konstantin Poltoranin has been sacked. The Federal Migration Service has confirmed that he was dismissed because of the comments he made to the BBC.